Nice Tour Incudes: Private transportation and English speaking tour guide, taxes, tolls and parking, entrance to villas. Note: Can be combined with Historic Nice City Tour to be a full day trip. Afternoons from November to March only. Let us take you on a unique tour of Nice. 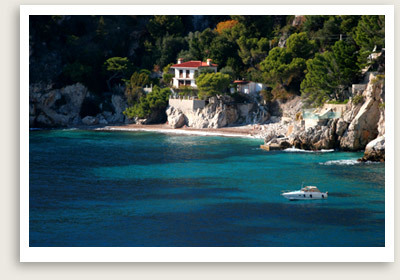 This private tour of the fine villas of Nice begins with a spectacular drive, soaking up the panoramic view from Mt. Alban overlooking the bay of Villefranche. You will have a brief stop in the old town of Villefranche, where you can visit the 13th century Rue“ Obscure, a covered street that was designed to protect residents from attacks. You will then drive by famous celebrity homes in Cap Ferrat, home of kings, film stars and business magnates. You can wander through the exceptional Renaissance-style Rothschild Villa and its seven romantic gardens, ranging from French to Japanese style, admiring the priceless treasures accumulated by Ephrussi de Rothschild during her lifetime. The tour concludes with a visit to Beaulieu, to visit an aristocrat’s fantasy come true: an incredible recreation of the 500 BC Greek Villa Kerylos — unique in the world! You will return by the middle Corniche Road.